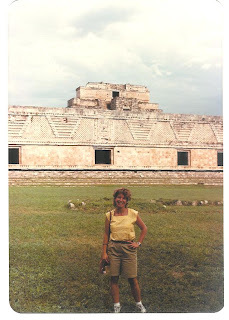 IN THE LAND OF THE MAYAS! 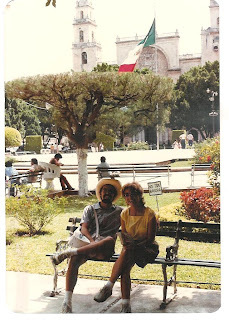 After Oaxaca and Villahermosa, we flew Aeromexico to Mérida. 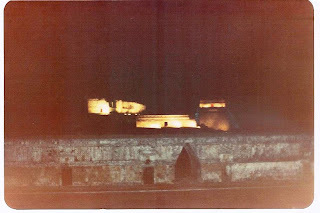 Mérida was founded on January 6, 1542, by Francisco de Montejo (a Spanish Conquistador known as «El Adelantado») and is the capital and largest city of the Yucatán state. 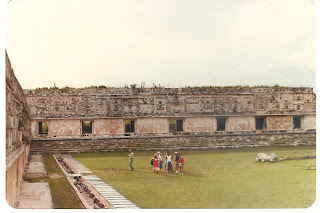 It was built over the Maya city of T'ho, and is nicknamed «The White City», both for the colour of its buildings and the fact that the residents keep it particularly clean. 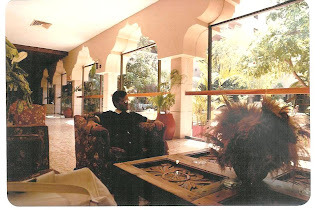 "HOLIDAY INN - By that time there was no Hyatt Regency skyscraper yet, so we stayed at the Holiday Inn. 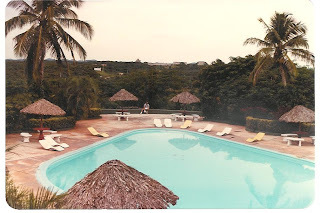 The Holiday Inn is located at Paseo de Montejo, one of the most beautiful city's avenues, and has a nice touch of colonial architecture, since it was one of the richest haciendas in 1542, when the city was founded"
"CASA MONTEJO is the building that was originally built for the Adelantado. 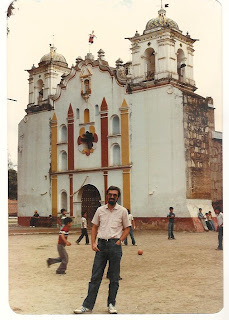 From such building, only the beautiful front is preserved, but it shows a great example of the civil architecture of Mexico"
"SAN ILDEFONSO CATHEDRAL, built between 1556 and 1599 by Juan Miguel Aguero in the place that once was occupied by the Mayor church, is one of the oldest cathedrals in the American continent. 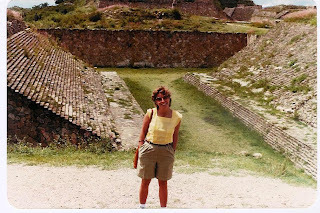 Its foundations were built with the huge stones from the pyramids dismantled by the Spaniards"
The archeological centre of Uxmal is located northwest of the Yucatan peninsula, roughly 50 km south-west from Mérida. 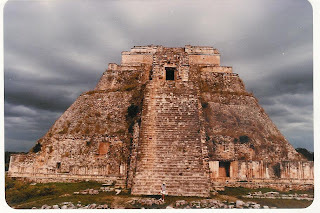 Uxmal (the name meant «built three times» in the Mayan language) is one of the most important parts of the late classic period (600-900 AC) of the Mayan culture, and is rated as the finest Mayan archaeological site. 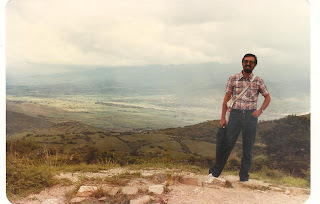 It was the greatest metropolitan and religious centre in the Puuc hills. 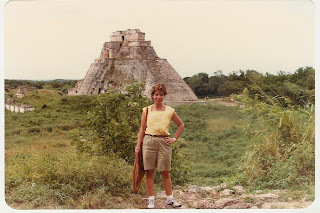 "THE PYRAMID OF THE MAGICIAN, at 30 m, is the tallest structure in Uxmal. 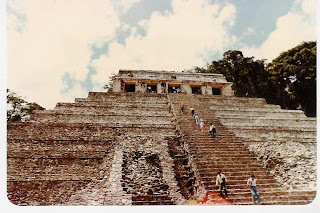 According to an ancient legend, a magician-god named Itzamna was supposed to have constructed the pyramid in one night. 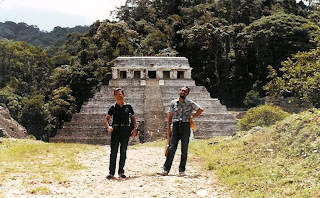 From archaeological excavation however, we know that the pyramid was constructed in five phases. 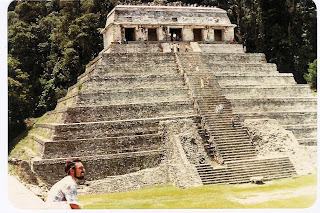 The legendary association of the pyramid with a magician may be understood as an indication that the structure had ancient use as a mystery school and ceremonial centre. 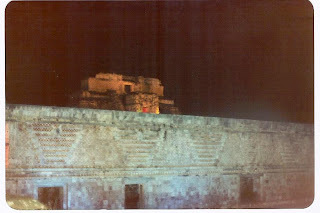 The entire city is aligned with reference to the position of the planets then known, and the pyramid is oriented so that its stairway on the west faces the setting sun at the time of summer solstice"
"NUNNERY QUADRANGLE - An incredible decor"
"MISSION INN BREAK between the day visit and the light and sound show"
After Oaxaca we flew to Villahermosa, the capital city of the state of Tabasco. 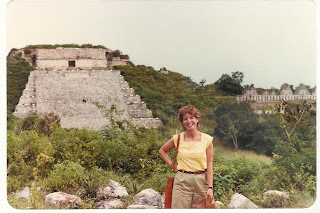 The main aim of our stay was to visit the Mayan archaeological site of Palenque - some 150 Km south east of the city, a bit more than a hour and a half drive - and that was the first thing we did. 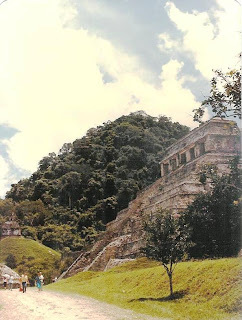 "ROAD Villahermosa-Palenque: I wonder whether this was already the current federal highway 186..."
"ENTRANCE to the city of Palenque, actually no real attraction to speak of..."
"JUNGLE - The site is hidden deeply in the jungle of Chiapas, on a densely forested ridge, and was already long abandoned when the Spanish arrived in Chiapas. 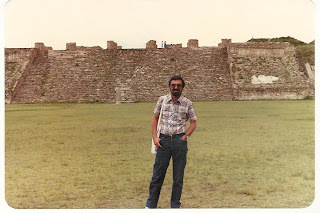 The first European to visit the ruins and publish an account was Father Pedro Lorenzo de la Nada in 1567. 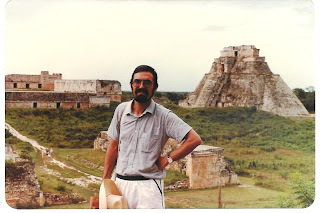 The ruin's existence, however, was lost and rediscovered several times until 1844 when the American lawyer John L. Stephens and the English drawer Frederic Catherwood introduced this jewel of Mayan architecture to the world publishing the book «Incidents of travelling in Central America». 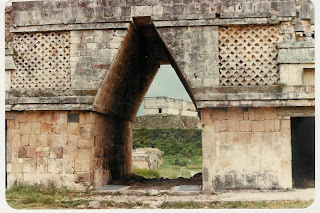 While the ruins have received some of the most extensive excavation and reconstruction efforts of any of the Mayan sites, only 34 structures have been opened of an estimated 500 that are scattered around the area. 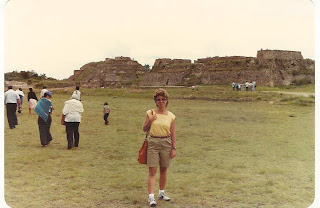 As one wanders through the ruins, small hills are seen everywhere about the site. 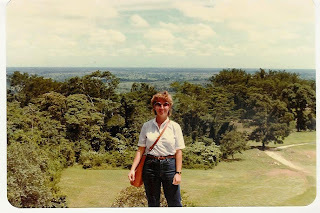 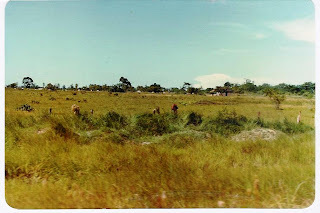 These are not hills however, but Mayan structures long overgrown with jungle. 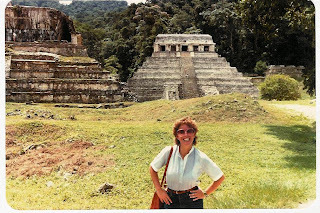 The site was included in the UNESCO’s World Heritage List in 1987"
"TEMPLE OF INSCRIPTIONS - The ruins of Palenque are considered to be the most beautiful of the Mayan city-states and one of the loveliest archaeological sites in the world. 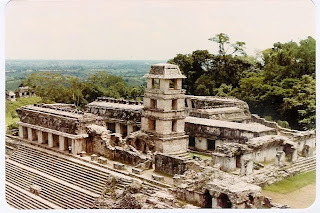 In its cultural apogee Palenque was even more stunning, for then its limestone buildings were covered with white plaster and painted in a rainbow of pastel tones. 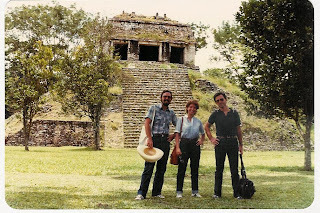 Most of the buildings were constructed between the 7th and 10th centuries AD, including this fabulous pyramid topped by the Temple of Inscriptions (Temple of Pacal Votan). 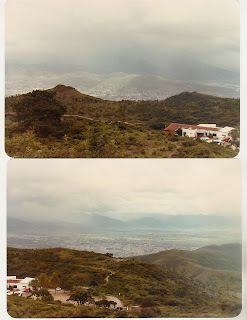 Then, mysteriously, the city was abandoned and reclaimed by the jungle. 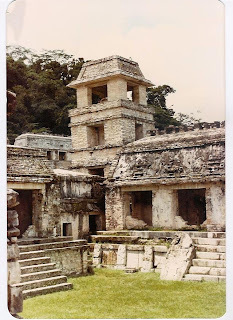 Even its Mayan name was lost (some would claim that it was named «Nah Chan»), and the ruins received their current name from the nearby village of Santo Domingo de Palenque. 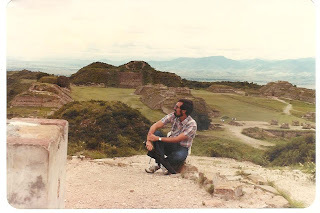 See the guy on the top with a Mexican hat on hand?" 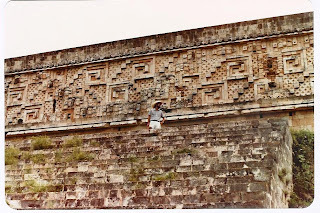 "INSIDE the walls of this remarkable pyramid topped by the Temple of Inscriptions there is an elaborate, 600 hieroglyphs-long text carved in stone detailing the city's ruling dynasty and the exploits of Pacal the Great. 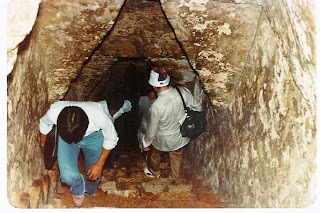 One of the major findings took place in 1949, when the archaeologists found a stone slab in the floor that could be lifted up, revealing a passageway to this long interior stairway leading down to ground level and the shrine/tomb of Pacal, the Great, profusely decorated in bass-relieves. 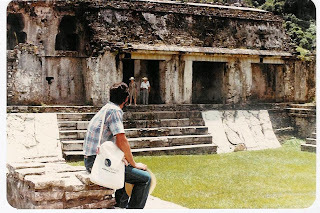 Inside this chamber was also found the impressive sarcophagus of Pacal, King of Palenque. 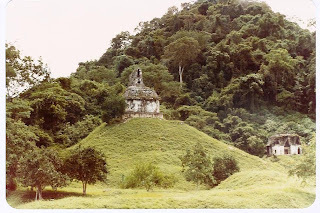 The building of this mausoleum is believed to have been ordered by the King itself. 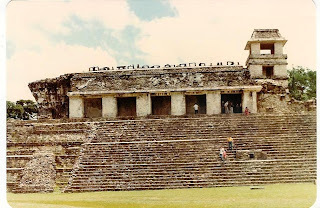 Over his crypt there is a sophisticated stone showing him falling into the underworld, and taking the semblance of one of the Maya Hero Twins who defeated the lords of the underworld to achieve immortality"
"THE PALACE is an extensive building complex (100 meters long and 80 meters wide) so named by archaeologists. 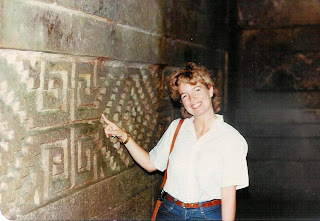 Its structure is pretty complicated, arranged by galleries, columns, interior yards, corridors, passages, scaled basements, and stone boards with hieroglyphic writings. 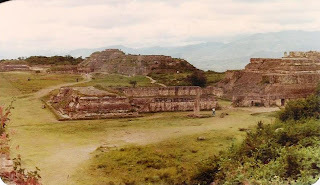 It seems that at least some portions of the building may have been used as residences for the high priests and the aristocracy, but it is also believed that the complex served as an administrative centre for the city. 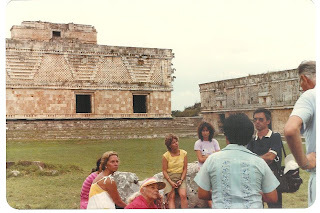 The four stories tower, originally without a roof, is an astronomical observatory, and its structural type is unique in the Mayan world. 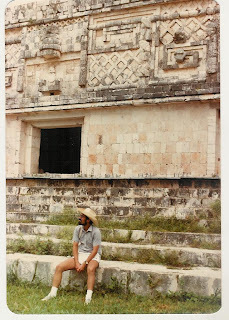 From the tower, on the day of the winter solstice, an observer will see the sun set directly over the Temple of the Inscriptions. 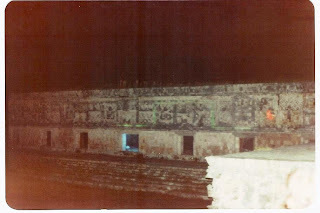 Archaeologists reconstructing the site, ignoring the Mayan astronomical knowledge, and thus the purpose of a stars-viewing roofless platform, capped it with a roof..."
"THE PALACE seen from the East side"
"INSIDE THE PALACE - Captives Patio"
"BAS-RELIEF - Palenque has many fine bas-relief carvings. 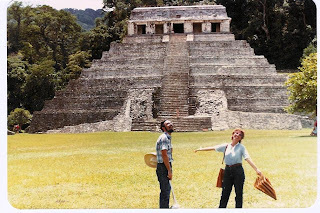 This one in the Palace represents the coronation of King Pacal"
"RUINS in the jungle, and tourists..."
"TIRED TOURISTS in front of the Pyramid of the Temple of Inscriptions: the hot and humid weather and Montezuma's revenge were bringing me down..."
"NO MIST - This is what you see when you enter the archaeological site (or when you look back while getting out). 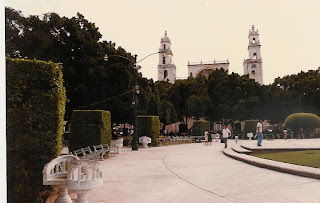 Sometimes, in the early morning, is a bit misty, but not by 1:30 p.m."
"LA VENTA PARK in Villahermosa - not be confused with the archaeological site of La Venta, which is located about 100 kilometres away on the Gulf Coast - is a wonderful getaway within the city for anyone wishing to see the works of the ancient ancestors of the Maya, the Olmec. 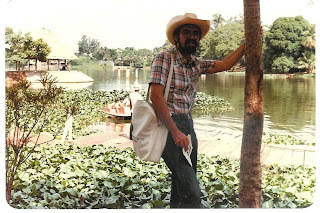 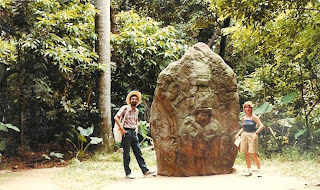 There are 28 Olmec carvings at this outdoor museum, transported from the archaeological site. 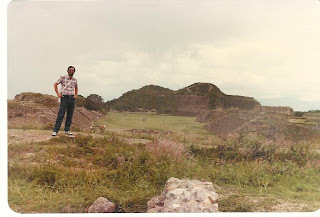 It also has an interesting lake"
"STELE TWO - The Olmec highest civilization dates from 1,200 B.C., although they were at their peak in this area from 800 to 300 B.C. 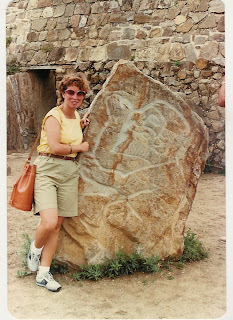 Many believe the Olmec were the cradle civilization for Mesoamerica, even calling the Olmecs «the mother culture of Mesoamerica». 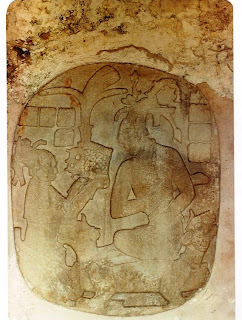 There is little doubt that the Olmec reverence for the prime deities represented by the jaguar, serpent and eagle, had a major influence on the Maya, Central Mexican and Zapotec concepts of these deities. 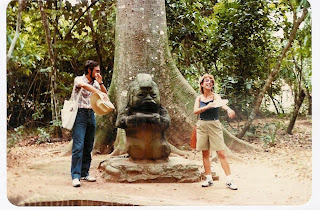 The Olmecs probably founded writing in Mexico and left behind a rich culture that has made the later civilizations of the Zapotecs and Maya some of the greatest civilizations in World History"
"FEMALE FIGURE - Some name this Olmec statue «the mother-in-law», others «the Grandmother». 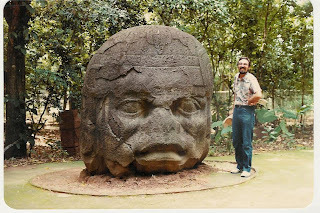 Whether right or wrong, the point was that mosquitoes were hideously attacking us nearby..."
"COLOSSAL HEADS - The main attraction of the La Venta Park are the famous ten foot high Olmec heads. 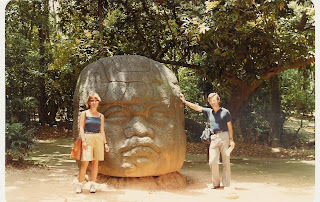 Intricately carved and massive in size, these heads are a stunning example of the sophisticated artistry employed by the ancient Olmec. 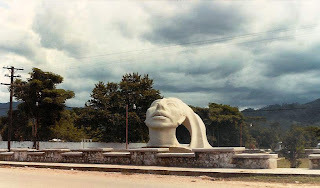 Here we can see the so called Monument One, The first amazing colossal stone head to be found in 1860 in the swamps of the Mexican Gulf Coast"
"MONUMENT FOUR, another colossal Olmec head!" 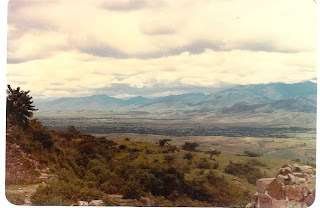 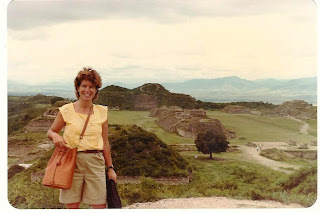 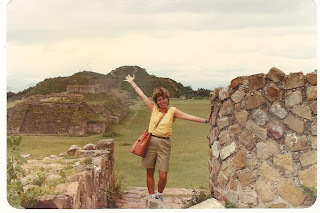 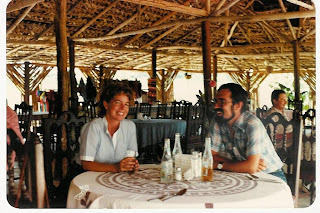 OAXACA VALLEY: MONTE ALBAN, TULE AND MITLA! 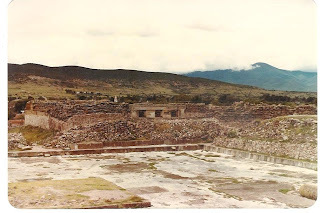 "THE SITE is located approximately 9 km to the west of the city of Oaxaca City, perched high above the surrounding valley"
"GRAND PLAZA seen from the Northern Platform - The archaeological site is built around the Gran Plaza, approximately 300 meters by 200 meters, with three pyramids occupying the centre of the plaza, along with the enigmatic Building J"
"PYRAMID SYSTEMS AND CENTRAL BUILDINGS"
"DANZANTES - The oldest carved stones at the site are the Dancers, featuring drawings of naked men in contorted and twisted poses. 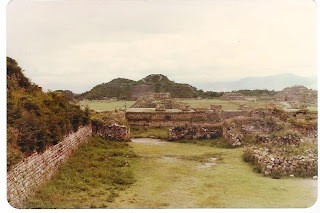 The notion that they depict dancers is now largely discredited, and the present consensus is that they represent those who lived and died in Monte Alban, including captives, warriors, and the sacrificed"
"ARBÓL DE TULE - Santa Maria del Tule, about 13 kilometres east of Oaxaca, is famous for its Tree, a Taxodium mucionatum, which is two thousand years old, about 40 m high and 42 m wide at its bottom. 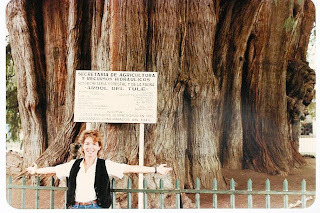 The Tule Tree has a volume of 705 cubic meters and an approximated weight of 509 020 kilograms. 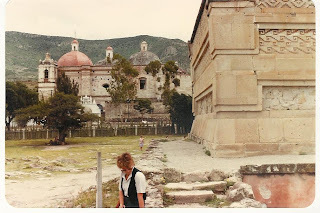 In its shade more than 500 people can be sheltered, and it takes about 30 individuals, hand to hand, to hold it at ground-level..."
"TULE CHURCH - Front view of the church with football playground..."
San Pablo de Mitla is located about 40 km southeast of the city of Oaxaca. 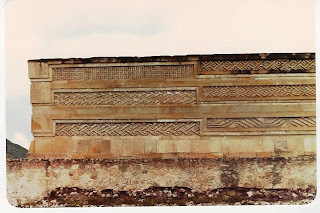 While archaeological evidence shows that Mitla was occupied by 500 BC, the earliest construction dates to only about 200 AD. 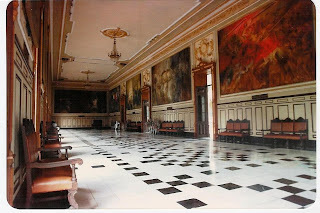 Construction of pre-Columbian style buildings continued up until the arrival of the Spanish conquistadores in the 1520s. 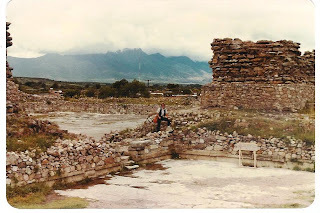 The ruins of Mitla are one of Mexico's most interesting sacred places. 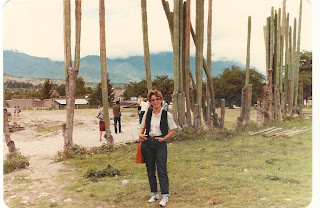 "CACTUS - Mitla's archeological site consists of 5 main groups of construction, the oldest of which is believed to date from between 450 and 700 A.C. High cactus receive the visitors to the site"
"CHURCH OF SAN PABLO - In 1494 the Aztecs conquered Mitla and sacked the city. 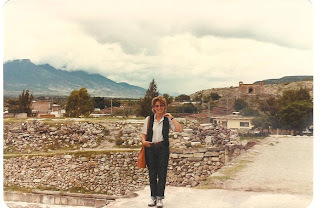 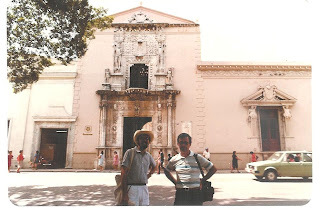 Once the Spanish took over, they found their efforts to convert locals to Catholicism thwarted by competition from native beliefs, manifesting themselves at ancient buildings such as those at Mitla. 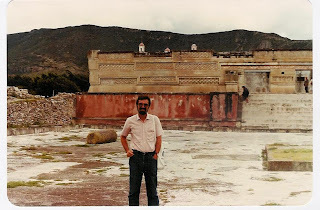 To combat the problem, the Spanish built a new church on top of a former temple"
"THE SITE - The archaeological zone of Mitla includes five main groups of structures and by the beginning of the Christian era the town had stretched for more than two thirds of a mile along either side of the Mitla River"
"THE PRE-COLUMBIAN BUILDINGS that survived still retain traces of paintwork"
"THE PALACE WALLS are decorated with distinctive geometric mosaics that characterize Mitla's buildings. 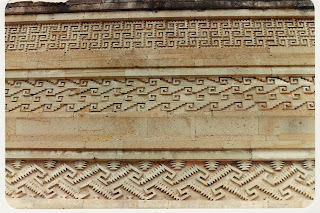 Each frieze consists of up to 100,000 separate pieces of cut stone. 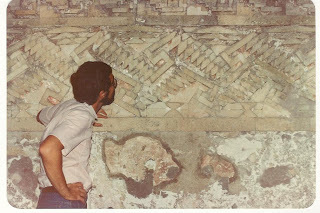 The motif of these intricate geometric mosaics are believed to be a stylized representation of the Sky Serpent and therefore a symbol of the pan-regional deity, Quetzalcoatl"